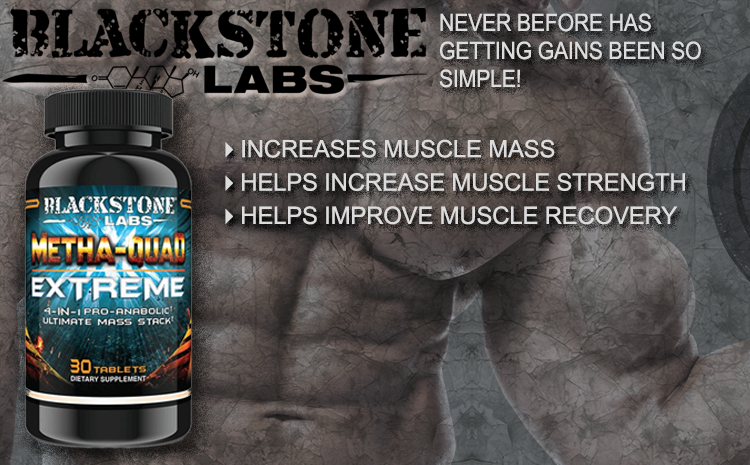 The Prohormone Quad Stack Returns With Metha-Quad Extreme by Blackstone Labs! Other Ingredients: Microcrystalline Cellulose, Phosphatidylcholine, HydroxyPropyl-beta-cyclodextrin, Phytosterol, Stearic Acid, Magnesium Stearate, Starch, Titanium Dioxide, Silica, FD&C Red #40, FD&C Yellow #6.. Directions: As a dietary supplement take 1 tablet within 1 hour of training. Do not exceed 2 tablets daily. Keep in a cool, dry, place away from light. The Quad Stack Is Back! Alone, the 4 compounds in Metha-Quad Extreme are enough to produce great gains but when combined a powerful phenomenon happens. The synergistic capabilities are unmatched putting your body into hyper drive giving your body no other option but to get stronger and pile on slabs of rock hard muscle! To seal the deal Blackstone Labs packed your whole daily dose into 1 small tablet. Never before has getting gains been so simple. Get your bottle of Metha-Quad Extreme today! 1-DHEA: This ingredient is a DHEA derivative that goes through a double conversion process to become 1-AD, also known as 1-testosterone, a compound that is up to 7 times more anabolic than testosterone. There is no conversion to estrogen with this compound so water retention is a non-factor. Additionally, as the muscle increases are dry in nature, gains are fairly easy to sustain during and after post cycle therapy. Androsterone: A metabolite of testosterone that can also be found naturally occurring in pine pollen and converts to dihydrotestosterone (DHT). This is a compound that hit the market years ago, but due to high production costs essentially caused many companies to skip using it. Androsterone's effects help users to increase muscle hardness, strength and improve vascularity. Additionally, this compound helps to increase fat loss through both an increase in lipolysis and the conversion of TSH to T4. The compound also helps to reduce estrogen-induced side effects such as gyno, water retention, and female fat pattern distribution. The compound has many similarities to Epiandrosterone, but research suggests that it is a considerably more potent androgen than epiandrosterone. Androsterone is also a potent neurosteroid and works as a modulator of the GABA receptor which makes it able to help influence mood and overall well-being. Arimistane: A natural compound that is a metabolite of DHEA, Arimistane is known as an "aromatase inhibitor." Aromatase is the enzyme that converts testosterone into estrogen, as an inhibitor of aromatase, Arimistane binds to the aromatase enzyme preventing it from converting your testosterone into estrogen. This prevents the production of excess estrogen and also results in higher testosterone levels, as by preventing the conversion to estrogen, your body's testosterone levels remain higher. Additionally, it helps to reduce cortisol, which is a hormone that actually causes muscle catabolism and increases in fat. As a standalone ingredient, Arimistane helps to increase muscle hardness and reduce body fat and water retention. Send Your Body Into Anabolic Hyperdrive! Get You Bottle Of Metha-Quad Extreme Today!